Scouts were excited when they grabbed their gear for a four-day winter adventure. Ice fishing, cross-country skiing, ice skating, snow tubing and snowmobiling were things worth getting excited about. Boy Scout Troop 33, chartered by First Lutheran Church in DeKalb, challenged Scouts each day with adventures that only winter could offer. Each experience offered something new to be involved in. The first day was mostly travel. Along the Wisconsin-Michigan border, nonstop activity kept Scouts busy with incredible experiences they’ll never forget. 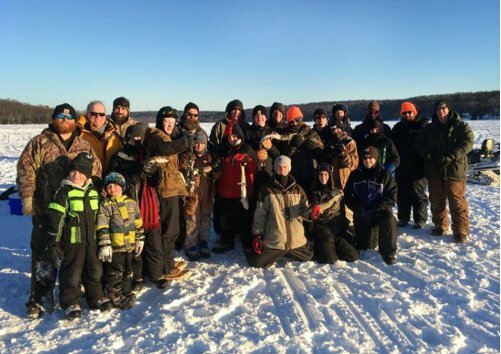 The second day involved venturing onto the frozen surface of Lac Vieux Desert where they enjoyed a day of ice fishing. Tip-up fishing devices were used. Tip-ups suspend bait through a hole drilled into the ice with an auger. A flag triggered up to signal whenever a fish took bait. Scouts gathered at a central point on the lake, with tips-ups surrounding them in all directions. Boys rushed out whenever a flag signaled fish. At times, multiple sites reacted simultaneously with boys moving in different directions. They took turns pulling up fish. Forty fish were caught, mostly northern pike plus two walleye and two muskie. They released the fish back into the lake except for eight large northern pike which they kept for dinner later that night. 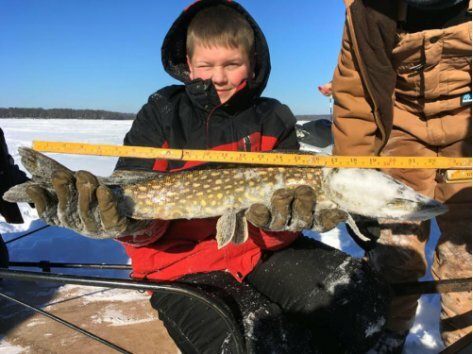 Their biggest catch was a 26-inch northern pike. Outside a cabin, fish were deep fried along with some french fries. Cheesy potatoes and sloppy joe sandwiches were added. On the third day, Scouts divided into two program groups. The first group enjoyed a variety of activities. After their cross-country ski lesson, groomed trails offered them routes that extended for miles. Some portions required a little work moving uphill followed by some excitement sledding down. They also enjoyed ice skating on a small frozen pond where they played some games. 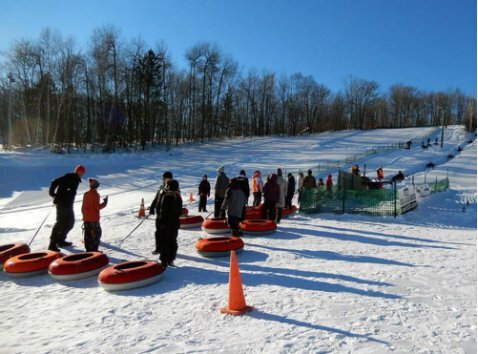 Sitting on snow tubes, a giant hill sent them flying fast and furious downhill with a speed powerful enough to set snow powder projecting all around them. That evening included a unique visit to a giant ice palace. Illuminated with white light and flickering colored lights from inside, it was a remarkable thing to see. The second group included Scouts, leaders and snowmobiles, all ready for an exciting adventure. Their route took them north across Michigan’s Upper Peninsula, which included traveling along beautiful wooded trails and great runs across ice covered lakes. Their snowmobile journey led them all the way to the shore of Lake Superior and back, a distance of 210 miles. Highlights included visiting an old iron mine and some fantastic views along Lake Superior. A pinnacle experience was stopping at an overlook above Lake of the Clouds in the Porcupine Mountains Wilderness Park. A majestic landscape spread out in all directions below them with a bald eagle soaring above. Some routes with poor trail conditions were a little rough, which made their ride all the more challenging. Their snowmobile adventure proved to be long and tiring, amazing and unforgettable. Both groups reunited that night to share their many stories while eating a pizza and lasagna dinner. It was a well-earned treat for everyone as they celebrated the many adventures of the day. The fourth day was their long drive back to DeKalb, which included stopping for a hearty breakfast and a final visit to the ice palace. Scouting adventure is done year round. The snow and ice of winter brought exciting new experiences to a group of energetic Scouts. Anyone interested in learning about Boy Scout Troop 33 can visit http://troop33dekalb.net.